We’ve all been there. You get home after a late night, collapse into bed and are about to drift off when your inner esthetician reminds you to remove your makeup. Before you reach for the makeup wipes you keep on your bedside table, think twice. 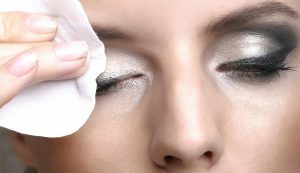 Aside from being packed with harmful and drying ingredients, makeup remover wipes don’t eliminate enough impurities to be a substitute for your favorite cleanser. When you’re strapped for time – or just plain exhausted – try the Eminence Organics natural solution for fuss-free makeup removal. The easiest way to sabotage your beauty sleep is to fall asleep without removing your makeup first. Dr. James C. Marotta tells Good Housekeeping, “Sleeping in makeup can be detrimental to the skin’s health,” clogging your pores during the crucial hours when your skin is in repair mode. As a result, your skin cannot properly shed and dirt, grime and environmental pollutants build up on its surface. very few makeup wipes contain ingredients that can actually break down all of your face oils, makeup and gunk on your skinWhile they may be convenient, “very few makeup wipes contain ingredients that can actually break down all of your face oils, makeup and gunk on your skin, so you’re really just rubbing bacteria, irritants and makeup wipe residue around your skin.” If you don’t rinse your face afterwards, that buildup of gunk and grime can seep back into your pores, clogging them even further. Rachel Nazarian, M.D. says makeup wipes “contain preservatives to make them safe from a ‘freshness’ standpoint, but these same preservatives are not necessarily safe to leave on your skin” (Marie Claire). In addition, makeup wipes are saturated with harmful chemicals that leave a residue on your skin if you skip rinsing. At Eminence Organics, we believe that healthy skin is a reflection of what you feed your body, inside and out. That is why we source premium ingredients from organic farms worldwide, including the award winning Eminence Certified Organic Farm in Budapest, Hungary. Our natural, organic and Biodynamic® skin care is free of harmful chemicals like added parabens, petrolatum, mineral oils, propylene glycol or sodium lauryl sulfate. Substitute harmful makeup wipes with Eminence Organics Rice Milk 3 in 1 Cleansing Water. This gentle cleansing water combines three skin care steps in one to cleanse, tone and moisturize the skin. Infused with hydrating rice milk and balancing pomelo juice, Rice Milk 3 in 1 Cleansing Water clears away impurities, brightens the skin’s appearance and removes all traces of makeup, naturally. As convenient as your favorite makeup wipe, this no-rinse cleanser doesn’t require a drop of water to sweep impurities from your skin’s surface. Eminence Organics President Boldijarre Koronczay tells Cosmopolitan UK, “Fruits, vegetables and herbs can create incredible results without the need of water.” Simply apply a small amount of Rice Milk 3 in 1 Cleansing Water to your face and gently remove with a clean cotton pad to reveal a perfectly cleansed complexion. For extra stubborn eye makeup, add Eminence Organics Herbal Eye Make-Up Remover to your bedtime routine. This best selling makeup remover uses cucumber, lavender, calendula and chamomile to gently and effectively cleanse the eye area – no rinse required. Ready to say goodbye to harmful makeup wipes? Find these bedside essentials at your favorite Eminence Organics spa – Fieldstone Spa!